For some people, genealogy is enough. BMDs, children’s names and extended family trees keep them busy. But some of us want more. We want to learn the details of our ancestors’ lives, find out what historical events affected them – and then write about them. 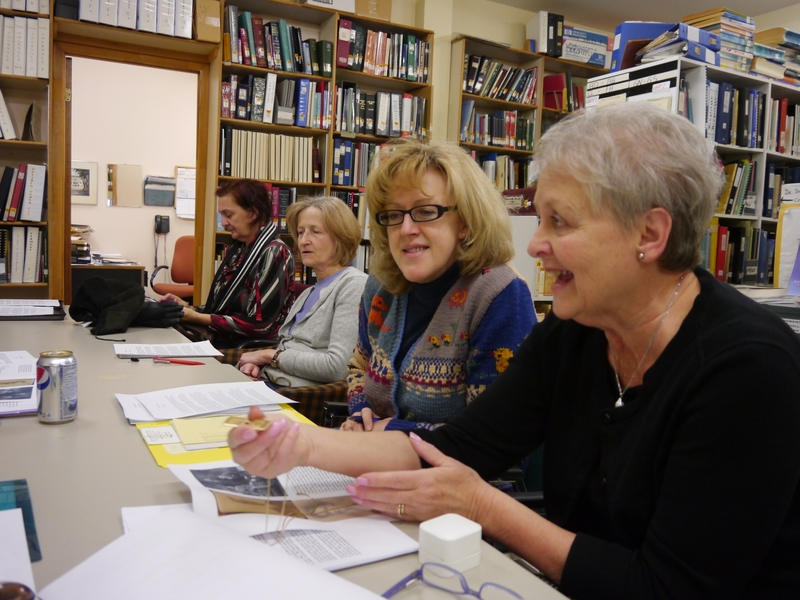 Once a month a group of us meet at the Quebec Family History Society library to share our ancestor’s stories, try to improve our writing skills, and learn from each other. There are two rules: articles are limited to 500 words, and we must list our sources. It isn’t always easy, but it is fun. This month Claire wrote about her great-grandfather François Evariste Fortin, a merchant and contractor in Pembroke, Ontario who lost and then rediscovered his Catholic faith. Barb’s story was about her grandfather James Rankin Angus, a Scottish carpenter who worked on the construction of the ocean liner Lusitania, then spent 20 years running a book store in Quebec City. Lucy has been writing about the Hanington family, the first English settlers in Shediac, New Brunswick. Janice’s subject was Robert Hamilton, a Scottish weaver who took up farming in Scarborough, Upper Canada. Mary told the story of great-grandfather Ismael Bruneau, a French-speaking Protestant minister. Dorothy wrote about Norman Nicholson, her husband’s great-grandfather, an ordinary man who had one extraordinary habit: for five decades he kept track of every aspect of his life, from business expenses to a dating diary. Oskar focused on Abraham Martin, from whom his granddaughter is descended. The Battle of the Plains of Abraham was fought on his land, but consensus about Abraham’s life ends there. Some stories say he was a farmer, others call him a river pilot. Some accounts say he returned to France for several years, others say he stayed in Quebec. Oskar clarified the confusion even if he didn’t resolve the conflicts. Ruth wrote about her search for John Morrison. This being a common name, she couldn’t figure out which John Morrison in the 1861 census of Scotland was hers. John’s mother’s name was the less common Robina, and his daughter was also Robina, so she looked for Robina and found John in Illinois. Next month some of us may do rewrites and others will tackle new subjects, but we are all making progress on writing our family histories, 500 words at a time. To learn more about this Special Interest Group, go to http://qfhs.ca/cpage.php?pt=90.